Gold’s job data-induced Friday meltdown continued into Monday’s early session hours, adding another $25 to the sacrificial price bonfire and dragging the metal down to almost $90 lower than where it had found itself literally just hours ago. Somewhere, far away, one Isaac Newton, stopped rolling over in his grave, and expressed content as to the laws of gravity still being applicable in this particular quadrant of deep space. In the background, the US dollar was piling on another 0.32 and traded at 76.02 on the index, while the euro slipped to under 1.48 against it. Not much net change in oil, however, which, despite touching a two-month low, dropped only 61 cents to near $74.75 per barrel. Monday’s opening bell brought an expanding pool of red ink to the precious as well as base metals price tickers. The Kitco Gold Index showed that gold’s $21 loss was in large part ($16.30) attributable to continued selling of the metal and less so ($ 4.70 of the overall drop) to the dollar’s advance. Support in the yellow metal is now thought to be found near $1130/1135 but the target being aimed for could also possibly lie deeper – near $1072 per ounce. That remains to be seen. In any case, gold posted a $20 loss on the open, quoted at $1141.50 per ounce, while silver sank 38 cents to start at $18.09 the ounce. Platinum lost $12 to $1427 and palladium fell $7 to the $365 mark basis spot. Rhodium was unchanged thus far, indicated at $2280 per troy ounce. Whether the Friday jobs figures will eventually be regarded as the pivot point which enabled the Fed to bring out the "big" mop, well, that is a good question. Ask us again, circa Q2 of 2010, even though bets that the Fed will tighten have now moved from the ‘invisible-until-August-at-best’ column, up to June, and even March. Clearly, the 125,000 jobs (as opposed to the actual 11,000) that economists expected to see having been shed when the Friday numbers were released were not filled with "Mall Santa" positions. Something must be afoot in the US economy. We will eventually learn what. The best thing that can be said for now is that the markets have shown that hot air -of the variety seen in practically every news item over the past two weeks- is insufficient as fuel for bubbles. There always comes a point, or a headline, or a time, at which someone, somewhere, is the first to hand over the hot potato or canvas bag, and suddenly the next holder finds…no bids (except, a lot lower). "One [item] worth noting was a warning from the Chinese. Worth noting especially when that individual is a vice governor of the People’s Bank of China. Said Mr. Hu Xiaolian: "we must watch out for bubbles forming on certain assets, and be careful in those areas.” As reported in "Chinese central bank wary of gold bubble" by the Financialpost.com, on 2 Dec 2009. That seems like a fairly good indication that China is not going to be buying gold at these prices. Ned concluded that: "Since we are going to for the present think in correction mode, what seems to be the down side risk for $gold? The major support line for $gold is $970. Could it go that low? Yes. Given the level of emotions on gold this past month, a serious unraveling of that intensity may be necessary." Two weeks ago, an exchange-traded fund that replicates the performance of junior gold-mining issues began trading on the NYSE. Ten years into gold’s rally, the purveyors of the fund are finally sure enough of the trend to bring this fund to market. Yet, the junior gold-mining index that the ETF is based on, topped in November 2007. 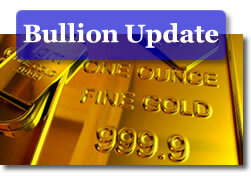 Its lower price today creates a large non-confirmation relative to gold bullion. Also in place is the non-confirmation between gold and silver, the latter having topped in March 2008. A prominent and well-respected market forecaster recently said that golf will not go below $1000 an ounce again, ‘probably ever.’ Maybe he’s right, but in our experience, such definitive and limitless exhortations are expressed only when a trend is at the extreme, outer limit of its lifespan. Gold prices have closed up 18 out of the past 21 weeks, creating a condition in which the Daily Sentiment Index (trade-futures.com) registered 90% bulls or higher for 18 straight days. This string included back-to-back days of 97% bulls for the first time in the 22-year history of the data. The final legs of commodity advances can be dramatic, and gold’s powerful rise over the past several weeks fits this description. The severity of gold’s upcoming decline should surprise investors. Our downside target of ‘below $680’ has not changed." "Gold’s best year in three decades has yet to match the returns of an interest-bearing checking account for anyone who bought the most malleable of metals coveted for at least 5,000 years during the last peak in January, 1980. Investors who paid $850 an ounce back then earned 44 percent as gold reached a record $1,226.56 on Dec. 3 in London. The S&P 500 stock index produced a 22-fold return with dividends reinvested, Treasuries rose 11-fold and cash in the average U.S. checking account rose at least 92 percent. On an inflation-adjusted basis, gold investors are still 79 percent away from getting their money back. "You give up a lot of return for the privilege of sleeping well at night," said James Paulsen, who oversees about $375 billion as chief investment strategist at Wells Capital Management in Minneapolis. "If the world falls into an abyss, gold could be a store of value. There is some merit in that, but you can end up holding too much gold waiting for the world to end. From my experience, the world has not ended yet." "Almost everyone is buying it — or wants to. But it’s hard for many investors and traders to wrap their heads around the idea of paying top dollar for a commodity that looks to be trading higher largely on unbridled investor demand — and perceptions of the yellow metal as a store of value in times of economic stress. Now there is a sense, at least in the options market, that it might be time for gold to take a breather. For the first time in recent months, the puts on SPDR Gold Shares (ticker: GLD) — the exchange-traded fund that everyone uses as the primary proxy for the commodity — are becoming more expensive relative to calls. Such a change would be practically invisible to most investors, but sophisticated investors and professional traders watch them closely. Why? Changes in “skew,” which is the difference between the volatility of out-of-the-money puts and calls, is often the canary in…the gold mine. “Skew has come in a lot, and it has flattened. This tells you that more people want to buy protection than buy upside calls. This is natural with anything that has had a big price run-up, but this is somewhat of a bearish indicator for gold. The mood is changing,” a proprietary trader at a major international bank said Friday, requesting anonymity because he’s not allowed to speak to the media. The changes in skew, and GLD’s price, prompted one investor to close a very large bullish position at a loss: After buying 70,000 December $118 calls Friday, Nov. 27, and selling the same number of December $121 calls, this investor closed the position Friday, Dec. 4. On Friday, GLD put-and-call volatility swirled a bit, as the employment report was heralded as a sign that the economy might be recovering from the ravages of the last two years. If this proves true — and "if" is the operative word here — the incessant demand for gold may waver. And its price, decline." More tea leaves to be read, more potential difficulties ahead — Credit Suisse is among those who see some rough sailing in early 2010, as they told Marketwatch this morning: "Friday’s developments illustrate the potential impact of a longer-term bottoming in real interest rates on gold prices,” wrote analysts at Credit Suisse in a note to clients. “This is one of the main risks for precious metals next year and is why we expect some headwinds for gold in the first quarter of 2010,” they said." Check out other site market resources at Bullion Prices, Silver Coins Values and the US Inflation Calculator which easily finds how the buying power of the dollar has changed from 1913-2009.